Bozeman Mayor Carson Taylor on Monday delivered a proclamation declaring the second Monday of October a city holiday honoring indigenous peoples, as an alternative to Columbus Day, to applause and tears during a packed City Commission meeting. “As the mayor of Bozeman, I proclaim that the city of Bozeman supports the contributions of American Indians to our community, economy and rich culture by observing and celebrating Indigenous Peoples Day,” Taylor said, reading from previously published text. “Bozeman is built upon homelands and villages, and traditional use areas of the Bitterroot Salish, Pend O’Reille, Kootenai, Blackfeet, Northern Cheyenne, Crow, Chippewa Cree, Assiniboine, Gros Ventre, Dakota, and other Indigenous nations of this region,” Taylor said. “Aho” — amen — someone shouted from the crowd as Taylor’s reading came to a close. Among the measure’s backers was Sadie Parker, 10, who introduced herself as a student at Morning Star Elementary School. 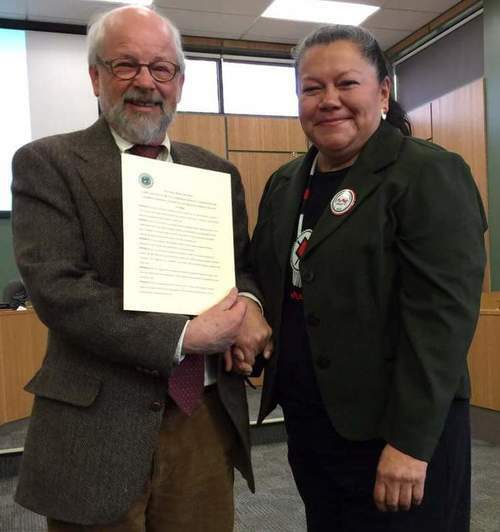 Shortly after tearfully accepting a written copy of the proclamation from Taylor, activist Marsha Small said she was grateful for the community’s support for the Indigenous Peoples Day holiday. She said she was pleasantly surprised no one voiced opposition. Columbus Day, recognizing the Italian explorer whose 1492 voyage spurred European colonization of the Americas, has come under increasing criticism from people concerned that it promotes a Eurocentric view of history and downplays atrocities inflicted by the explorer and his successors. While recognized by state and federal governments on the second Monday in October, it doesn’t currently see city offices close since city staff work the holiday in exchange for having the Friday after Thanksgiving off. In order to mark Indigenous Peoples Day, the proclamation says the mayor will organize a presentation before the City Commission each year on an aspect of indigenous culture.